I keep looking at the clock and checking timeline stamps, figuring out that her last post was made around 1 a.m. I look back through the holiday photos of a beaming family on Christmas morning, unaware that, in less than 24 hours, one of their own will be gone. I got a text with bracing news that a friend passed away Christmas night. Technically, I guess it was Dec. 26 — the day when many of us are busy collecting the discarded boxes, bags and bows, nibbling up the last of the Snowflake cookies, and putting away the good dishes that come out only for special occasions. I am still processing this startling news I have gotten; using social media to feel a little closer to our friend who slipped quietly away while we were wrapped up in our own holiday revelry. I scan through my friend’s photos to see her smiling back. I look at the picture of us together and she is radiant, happy, looking directly at the camera. This picture of her and me and a bunch of moms crowded around a table on warm, October evening makes my soul happy. We are laughing and having fun as only women can do in the company of other women. It was our evening to reconnect and reminisce, away from the demands of jobs and families, laundry and lists. I met my friend through this Pokeno group — a group of moms who get together once a month to play games, share food and news, laughter and fun. I have attended Pokeno nights with these ladies, on and off, for about a decade now. We have watched each other’s children grow up, our waistlines grow thicker, grey glitter our hair. We started the games when our children were in elementary school. For many of us, we have just welcomed our college kids home for the holidays — backpacks and laundry bags in tow. I was fortunate to make it to game night in October, happy to reconnect with these ladies who let me forget my worries for a while. My friend and I sat next to each other, and I was grateful for the chance to catch up on her news, her life. On this perfect fall evening, we clinked glasses, told stories, laughed until tears streamed down our cheeks. At the end of the night, we hugged our hostess and carted away our casserole dishes. My friend drove me home that night, and we chattered the whole way, giddy girls making plans for lunch and a theatre outing. In the next days, we traded e-mails and Facebook messages, missed calls and missed opportunities. Days melted into weeks, weeks into the next month, and plans got rescheduled in the haste and hurry of everyday life. Family illness kept plans in limbo. Holiday obligations soon crowded the calendar. My friend and I were supposed to meet for lunch. We were supposed to meet for dinner. We were supposed to see a play together. We were supposed to make time for laughter and life. Instead, I am sitting here, looking at a picture of a beautiful, smiling soul that slipped away while I was sleeping. I reread her last post: A message to her family about love. My heart is heavy and weeping for the family she leaves behind — Her daughter a year younger than mine; Her family shocked and grieving with this sad and sudden day. I am only a friend, and not a very good one; I should have been a better one, should have been more, done more. I should have made the time when I had it, made more effort for that promised lunch, the dinner that never happened. Instead, I am dropping off a casserole at her home to feed her family. Soon, I will go see a play with an empty seat next to me. It is what I deserve. It is what happens when we look the other way and let time and people slip by. My friend posted this on her social media page. I am haunted by its honesty. I wish I could be your angel, my friend. I wish I could carry you. I wish life wasn’t so damned fragile — like a Christmas ball that slips from the tree, falls to the floor and shatters into tiny, golden shards. You, my friend, have taught me this hard and humble lesson. I’m just so very sorry I didn’t pay attention sooner and embrace the moments while we had them. We live under the false assumption that we’ll always have another day, another chance, plenty of time. We forget that life is fragile and there are no guarantees we’ll wake to embrace another day. I’ll remember that October evening. I’ll remember the laughter. I’ll remember the bright smile of a sweet and special lady who held my hand and touched my heart at a crowded table on a warm, October night. Godspeed, my friend. 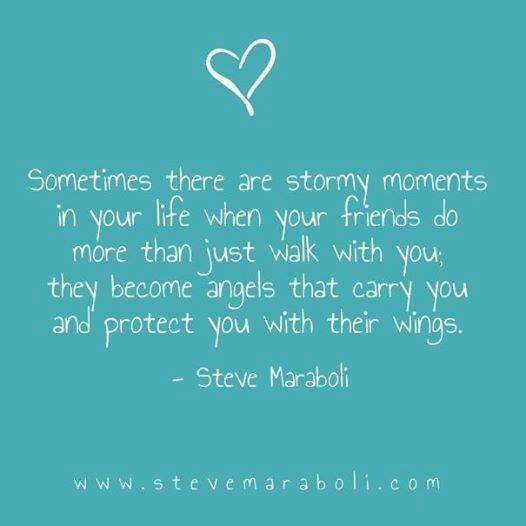 May angels carry you and protect you with their wings. This entry was posted in Uncategorized and tagged alzheimer's disease, angel wings, angels, caregiving, friendship, holiday sadness, losing a friend, mourning, sudden loss, women groups. Bookmark the permalink. I hear good memories live in the heart and soul forever. I try to keep my ears open as much as I can.